Born in Cromarty on the Black Isle (the National Trust for Scotland now own the thatched cottage where he was born and which had been built by his great-grandfather), Hugh Miller was initially a stone mason. However his enquiring mind and ability to communicate got him a job in Edinburgh writing verses, pamphlets and articles for magazines. He had a great interest in geology and published papers and then a books on the subject including "The Old Red Sandstone". 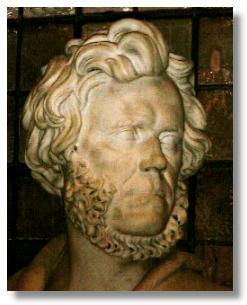 He pioneered research into fossils and the relationship between the different geological ages. See also the extensive Hugh Miller Web site.